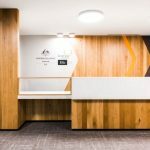 The Western Australia Industrial Relations Commission (WAIRC) in Perth undertook a complete refurbishment in 2016 in an effort to upgrade the Court Rooms and Hearing Rooms, and provide employees and public visitors with a welcoming space to work and communicate. 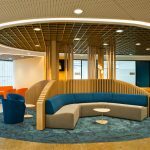 IA Design were engaged to refurbish four floors at 111 St Georges Terrace, each occupied by the WAIRC. The brief sought a contemporary and welcoming feel that maintained the gravitas and restraint expected of court environments. To achieve this synergy, the IA Design team undertook extensive briefing with court officials to manage the design of the meeting areas, Court Rooms and Hearing Rooms. The resulting environment balances traditional finishes and contemporary design features to achieve the stated objective. A focal point in the space is the unique timber panelled patterned ceiling which adds visual interest, as well as the careful placement of lighting throughout the four floors. Special attention was focused on the acoustical design on the Court Rooms and Hearing Rooms, which involved the inclusion of state-of-the-art AV equipment. The success of this project was driven by a close relationship between IA Design and the WAIRC, resulting in a stunning environment that has been since recognised by the President of the WAIRC.